As a screenwriter, Anders Thomas Jensen has provided some of the strongest material for a few very serious-minded Danish filmmakers, which quite ironic considering the tone of the films which he seems to prefer making as a director. Although it has been 10 years since his last project as director, Jensen hasn’t missed a beat. Men & Chicken would make a perfect companion piece to Adam’s Apples (2005), not to mention the darkly comic similarities The Green Butchers (2003). For those unfamiliar with Danish cinema, it doesn’t much matter. The fact of the matter is that Men & Chicken is unlike any film to come out of Denmark or any other country, though it has layers of familiar elements from a number of unlikely sources, combined to make a wholly unique experience. Joining subtle elements of science fiction and horror with the irreverent spectacle of slapstick, within the simple narrative shell of a familial drama, Men & Chicken is a film that demands the unexpected be expected. The real miracle of Jensen’s film is how well he is able to blend so many opposing styles into one thematically cohesive narrative. The film follows two socially inept brothers as they discover the truth about their father during a viewing of his taped will. Gabriel (David Dencik) and Elias (Mads Mikkelsen) are shocked to find that they are only half-brothers, and that they have several other half brothers living in solitude on the small Danish island of Ork. Upon traveling to visit this unknown family, Gabriel and Elias discover a dilapidated mansion filled with all types of aberrations that lead to further questions about their father and his mysterious experimentations carried out in the solitude provided by the island. Though it veers into bizarre areas of science fiction and has a comedic tone throughout, the heart of Jensen’s film remains firmly tied to the drama of the relationship between Gabriel and Elias. When they first hear the news, Gabriel is relieved to discover that he is only half related to Elias. Elias is easily the odder of the two, though they are both the picture of normalcy compared to their reclusive siblings living on the island. Mikkelsen is probably best known for his villainous portrayals in the States, having played a Bond bad guy in Casino Royale, recently finished with the iconic role of Hannibal Lector in the recent television series, and as the super-villain in Marvel’s Doctor Strange. Men & Chicken is completely unlike anything that Mikkelsen has done in English, but it is even against type for his Danish contributions. Not only does he handle comedy with ease, Mikkelsen somehow also manages to embrace the character with such sincerity that he creates an unexpected sense of empathy for him. The result was comparable to what it might feel like if the character of Napoleon Dynamite was able to make you cry. 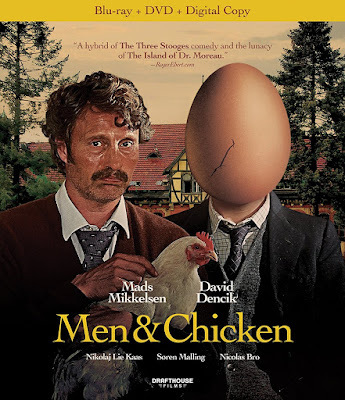 While Men & Chicken may not be an instant classic like some of Jensen’s other films, it is an unexpected treat for those filmgoers looking for something untraditional. Half of the fun in watching the film is trying to guess (often quite unsuccessfully) where it might be headed next. For someone that watches as many films as I do, this experience alone is something of a treat. The Blu-ray combo release for Men & Chicken also includes a DVD and Digital HD copy of the film. The package also comes with a 24-page booklet insert, which has an introduction written by Jensen and some spectacular set photography. The special features on the actual discs are disappointingly absent, including only a collection of trailers for other films.